Cardiff City captain Steven Caulker has admitted playing in the Championship next season could hinder his England ambitions. The 22-year-old is believed to have a release clause in his contract triggered by the club's relegation. Caulker, who has one England cap, says playing outside the top flight could restrict further appearances. "To be playing for England you more than likely have to be playing in the Premier League," he said. "I've signed a four-year deal with Cardiff and as it stands I'm a Cardiff City player and I'll be trying to get them promoted next season." Caulker cost Cardiff City more than £8m from Tottenham in July 2013. BBC Wales understands Caulker and team-mate Gary Medel have release clauses in their contracts which could be triggered by the club's relegation to the Championship, but potential buyers would have to meet the Bluebirds' valuation. Speaking after last Saturday's 3-0 loss to Newcastle, Caulker said: "I signed a four-year deal here so I'll be looking to get us back promoted next season." The former Tottenham and Swansea City defender scored on his one and only England appearance to date, a 4-2 defeat against Sweden in November 2012. Although he has not made further appearances Caulker has been called up on a number of occasions and has not given up on making Roy Hodgson's World Cup squad. "We'll see what happens this summer regarding the World Cup," added Caulker. "There will be no bigger honour if the call comes. There's great competition for places all throughout the England squad. "If I'm in and around the squad then great; if not then my focus will be on getting Cardiff right next season." Liverpool, managed by Caulker's former boss at Swansea Brendan Rodgers, have been linked with a summer move for the Fulham-born defender. 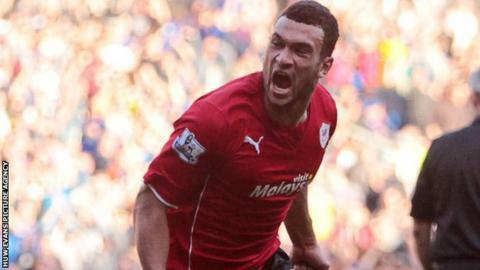 But Caulker insists his focus is on Cardiff's final Premier League game of the season, at home against Chelsea on Sunday. "It's always nice to hear good things and to hear that big clubs are sniffing around. That's all positive. "The key thing for me now is there's one game left of the season and it's important for me to put in a good performance. "We're looking to put in a performance for the fans. They've been brilliant to us, home and away, this season. "Our goal at the start of the season was to remain in the Premier League and unfortunately we've not been able to do that."